This past Friday, I was able to escape for several hours to fish all by myself. I got out there a little before 1pm, and hiked to the first spot I wanted to fish. It is a spot where the bucket is all the way across the river, and you have to hold your fly in there as long as you can while mending over a heavy plume of mainstream current. On my third presentation, I had a insane take, and the fish was running up through the main gut of current before I even knew what was going on. It bopped a huge air, and revealed its chrome bright look, and oversized native body before turning downstream and burning a turbo charged blistering run right to the tailout above a long set of rapids where it stopped on a dime. I thought puewww....., but then it turned back up, and ran so fast where I could not keep up with the line speed. It blew up another air, and turned down to the tailout and ran full speed to stop on a dime again right at the lip of the pool. It was totally out of control. I played this crazy wild fish, and thought I had it budged after it finally felt a tad bit more controlled. After a while, it ran to the tailout again, and I was working the line patiently back to me, when all of a sudden the line flew slacked into my chest. Wow!!! That was insane! A few casts later into the zone, and I had another one on for some brief head shakes. After a little while later, I decided to hit another pool. 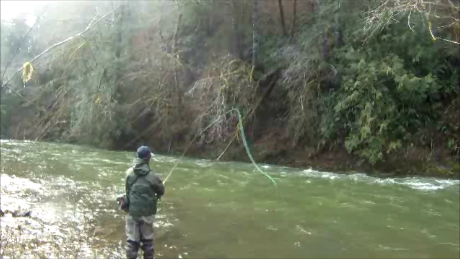 I went right to a spot where on a previous outing, I had a client tie into the largest steelhead of my guiding career. After several presentations, I had a dunk on my indicator, and I struck hard and tight in a downstream direction. I felt a mushy resistance, and knew there was life on the line. I pulled really hard to try and bring this mysterious beast up to the towards the surface to reveal it. Right when the fish materialized, I felt a head shake, and the line went free..... It was huge! It was gone! What was it that caused this short lived battle? My tippet was broken, and I basically felt like I blew it! I felt like my blood knot may have pulled free, but hard to tell. An opportunity to get my trophy of the winter and possibly a lifetime, and it was short lived. Besides blowing my trophy shot, and losing another awesome fish, I was fired up on the hot fishing I was experiencing. I went to the next run upstream, and I probed my offerings into the water. I had another dunk, and struck tight to get rewarded with another fine wild native winter steelhead. This fish went about 9 pounds, and it was a chrome bright buck. Fishing was hot on this day! I started to think about the first spot I fished, and hiked back to it. I fished it hard again, and was rewarded with two hooked and landed hatchery bucks. They were fun to fight, but nothing compared to the amazing wild steelhead I had tied into before. All aside, they were steelhead on the end of my line, and that is always rewarding. I ended the day with one more fish that took a swung fly, and it was a nice bright hatchery hen hooked in the tailout of a nice wide boulder ridden run. I left a little after 4pm, and it was a fun quick productive session of winter steelheading. You gotta love fishing sessions like that! Hell yeah, boy! Your stuff is great, Brian! I look forward to feasting on it every week and often quoting you on my website (hope you don't mind).